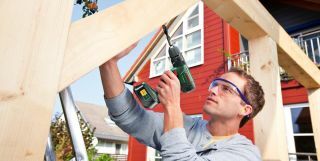 Whether you’re buying your very first drill for some odd jobs around the house, a seasoned handyman looking to upgrade to a more powerful model, or anything in between, there’s a power drill on the market to suit your needs. But what are those needs? The best power drills will make a flawless hole, without fraying the edges of the materials you are working with, but many have extra options like variable speeds, different gears, hammer mode (whereby rotary drilling is backed up by a hammer to break up tougher materials like concrete), and screwdriver mode. Most basic DIY jobs — drilling holes for hanging pictures, for example — can be covered by rotary drilling, either on a cordless drill driver, if you’re unlikely to need loads more functionality, or as a mode on a combination, or ‘combi’, drill, if you’ll be needing it for more varied tasks. There are others — percussion drills with a high torque for screwdriving jobs, ultra-powerful SDS drills for heavy-duty use — but most homeowners won’t need to go near these unless you’re undertaking some colossal construction work. Cordless drills aren’t only convenient, meaning you’re not restricted to working near a plug or having to bend awkwardly to accommodate unwieldy wires, they also heavily reduce the risk of receiving an electric shock and, of course, of tripping. You’ll have that shelf up in no time: no excuses now! At just over £350, the Makita Brushless Combi Drill is a major departure from our second-place pick, from Bosch, in terms of price. Of course, like all drills, it does roundly the same thing, but it packs a big punch when it does, with an impressive RPM and a max torque of 54. Its big thing, and the reason behind that price tag, is its brushless motor, which is responsive to pressure and materials, for variable speed and superior efficiency. If you’re a power tools pro who needs to use their drill often and on a range of surfaces, this is the one to get. If you’re in the process of building your tool kit, you’re in good hands with this cordless Bosch drill, which has our vote for best drill for beginners. It offers a good range of functionality for a very decent price, with 20 presets for torque and drill to suit most home DIY needs, and a keyless chuck for fast and easy bit changing. A very useful little addition is the integrated LED, for working in dark areas such as the shed, garage, or under the stairs. Solidly built, high-quality, and more than robust enough for daily drilling, this hammer drill is a great buy for contractors and hobby remodellers alike, and at a comparatively apprentice-friendly price, too. It has low vibration for comfortable working, its powerful motor keeps going and going, and it handles masonry and other heavy-duty materials with ease. If you’re working with bricks or concrete, this is a good, solid buy. This little drill packs a deceptive punch — compact enough to fit into all manner of cases and bags, or even hang off your belt, and lightweight enough to tote around to multiple jobs, but still powerful enough to get the job done. A good multi-tasker, it can deal with a variety of drilling and screwdriving tasks admirably, including hanging shelves and putting together flat-pack furniture. If you’re a jobbing builder, this is a great little buy as a second drill, but for heavier jobs, consider the Hitachi hammer. Like our Makita pick above, the DeWalt DCD790D2’s big selling point is its brushless motor, which keeps the drill’s battery going for longer while still offering incredible power, an impressive 60Nm of torque. It’s not quite as gung-ho as a hammer drill, but it still makes a good go of thick wood and metal, as well as more delicate surfaces. Its intelligent trigger controls prevent the drill being overloaded, for continuous work without worry. A great all-rounder for power and efficiency — if you had your eye on the Makita, but can’t justify the price, this offers many of the same charms for a smaller price. The Terratek 18V Cordless cuts down on cost without cutting down on quality, making it our best buy for the odd job, or for first-timers. It’s fairly basic, offering drilling, impact drilling, and a reverse facility for screws, but if that’s all you want it for, it’s pretty much perfect. Little touches like a fixable operation switch for continuous drilling, and a belt hook for hands-free roving, won’t be totally necessary for all, but are good for the price.